Brannon is terrified of storms and his family is trying to help him, but they are only making him more scared until one of his relatives mentions that thunder is like dinosaurs stomping around. 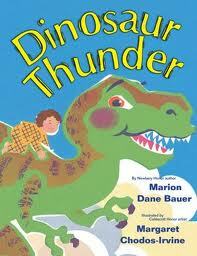 Brannon loves dinosaurs and that makes the thunder a lot less frightening. This would be a great book for children who love dinosaurs and/or children who might need a little help getting through thunderstorms. 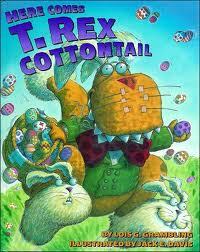 You can imagine that T. Rex probably isn’t the most graceful Easter Bunny, but when his friend Peter Cottontail gets a cold at Easter, he does what any good friend would do and steps in to help. Luckily T.Rex has some other dinosaur friends who help him find some more eggs (when he breaks the first set) and help him dye them for the children in town who are going to be looking for their eggs when they wake up in the morning. Unfortunately, T. Rex and his friends oversleep on Easter morning…you’ll have to read the rest to find out how they make things right. 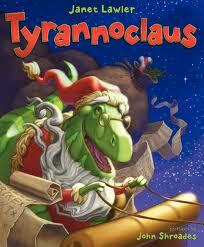 This books follows in the spirit of The Night Before Christmas, but with a dinosaur twist. It has a little drama…an herbivore eats Santa’s list and then there’s a volcano that Tyrannoclaus and his reindeer dinosaurs have to navigate their way through, but it is also a sweet rhyming story or Tyrannoclaus persevering to get all of the dino kids their presents. 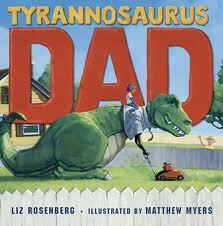 If you have a child who loves dinosaurs, then they will love this book. Harry takes his bucket of dinosaurs to school on the first day of school, but leaves them outside his classroom with the lunches and coats because he’s too shy to ask if he can bring them inside the classroom. 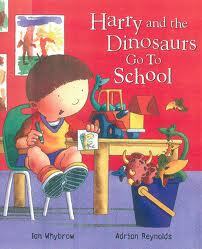 Harry is not enjoying his day without his dinosaurs until he finds another friend who is also having a not-so-great day. It turns out that they both LOVE dinosaurs and it also turns out that their teacher loves dinosaurs, too. 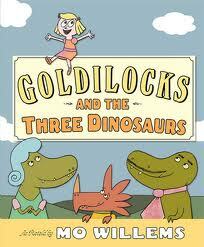 This would be a great read for any child who loves dinosaurs. It would also be a great story for a child starting preschool or kindergarten soon. All Brontorina wants is to be a ballerina. It turns out that she is actually very good, but there is the problem of space. Madame Lucille’s dance studio just isn’t big enough for all of her students AND Brontorina. No worries though, they all work together to find a new space that is big enough for everyone. 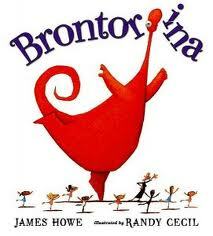 Super cute story that reminded me a little bit of Clorinda, another super cute story about a dancing animal. I have people ask me quite often about beginning chapter books for boys that are appropriate for the early elementary years. There are so many great ones out there and Jack Stalwart is one of my all-time favorites. Jack is a secret agent/spy who travels the globe looking for his older brother Max who is missing while also fighting crime along the way. Why do I love these books so much? There aren’t a lot of books out there for this age group that are in the spy/secret agent genre, it is a great way to get kids excited about and learning about geography since he visits a different location in every book, it’s a series-kids get sucked into series and don’t want to stop reading until they have read them all, it has pictures sprinkled in here and there which is great for kids this age and it has short chapters. They are also great read alouds as well, so you can read them to your child, your child can read them to you, you can take turns or, if they are ready, they can read them on their own. T.Rex wants to go trick-or-treating with his friends Stegosaurus, Iguanodon and Diplodocus but he can’t decide what to wear that would make him look scary. His friends are already going as a ghost, a witch and a skeleton. His friends have a couple of suggestions but T. Rex decides those aren’t scary enough. Finally, they decide that he’s pretty scary just being himself. 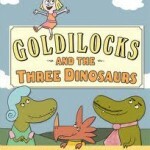 Super cute story with adorable illustrations especially if you have a dinosaur fan in your house.